#PetTheft debate is on 2nd July 2018 in Westminster Hall at 4.30. Please email your MP. At last the day we have all been waiting for! Now we must all write to our MPs asking them to support us and attend the #PetTheftReform meeting. Pets are family, not things! The law currently doesn’t reflect this and looks at the pet’s purchase price when sentencing. While there is a maximum possible sentence of seven years for theft, pet theft rarely results in any custodial sentence. Pet theft is therefore seen as a low-risk, high-reward crime and is on the rise. Pets are priceless, irreplaceable and their loss wrecks lives. Only one in five stolen dog is ever recovered, people have no closure and are traumatised by the worry of what is happening to their pet – even if the crime is investigated, these cases rarely get to court and seldom result in a custodial sentence. 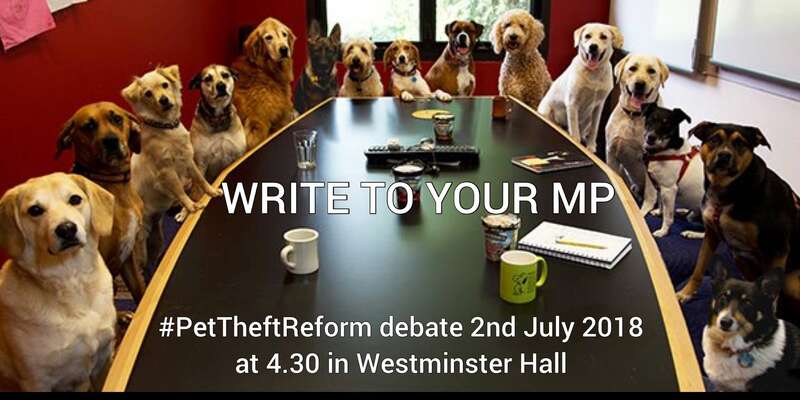 If your MP wants to know more there’s a #PetTheftReform drop-in on the same day as the debate; Room 10, Westminster Palace, from 1-4pm on Monday 2nd July. Photo opportunity for social media. Please note the #PetTheftPetition debate will be on the 2nd July 2018 in Westminster Hall at 4.30.